What emerges is a microcosm of revolution and populism, crime and traffic, yearnings and despair. It’s quite something – kudos to Vocativ for having the patience to wait until a story like this emerges. For those aspiring writers out there, notice as well how Boris masterfully evokes the feel for the place – the smells, the scenery, the people’s lives. Little details – things such as “[g]usts of wind blew candy wrappers across the building’s atrium” or the fact that Luiselmy Reinoso, a 31-year old resident, has five children – linger in the mind long after the piece is done. The architecture of the piece holds its own next to the building itself. By conveying the lights and shadows of life in the tower, Boris seems to be conveying his own ambivalence toward the setting for such a great story. After all, the Tower may be a hell-hole, but what a treasure trove it has been for journalists. 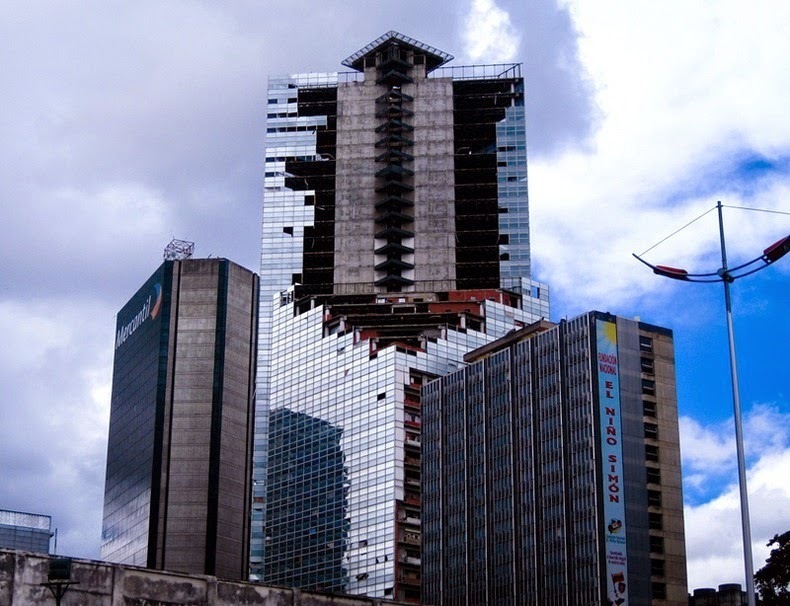 The demise of the Tower suddenly makes Caracas a little bit less interesting, just as the demise of the Revolution will inevitably (hopefully) make Venezuela a tad more normal. Followers of the tower story will be surprised to learn that “El Niño” Daza, the “leader” of the Tower that was the main subject of an extended piece by Jon Lee Anderson in the New Yorker last year, no longer lives in the Tower. According to a resident who spoke to Boris, Daza is in prison for unexplained reasons. Is he a political prisoner? What is he being charged with? Nobody knows. It’s one of those things that mysteriously happen in revolutionary Venezuela. “Not all the Tower’s residents are poor, and the differences in wealth are obvious. On one visit, I bumped into Mayra Castillo, a 26-year old government employee with an undergraduate degree in education. Her husband works for Venezuelan state television, and the couple owns a car and a nice two-bedroom apartment with ceramic tiled floors.